I've started working on a Caille Grand Prize Jackpot 4-reel machine I picked up a while back. As you can see, it's in terrible shape and needs restoration. Under all the paint I can see that the cabinet originally had a green finish. My question to you guys, the green finish, is it paint or some type of stain? If anyone has a nice original machine with this green finish, can you see the grain of the wood under the green finish? Rick-okc wrote: I've started working on a Caille Grand Prize Jackpot 4-reel machine I picked up a while back. Yes, on every original-green-finished Superior I've seen, the color appears as more of a stain than a paint, with the wood grain clearly showing through the finish. The steel back doors were often painted with a green simulated woodgrain, as if to carry that "look" all the way around. Marsonion, thanks for the information and link. That was very helpful. Rick-okc wrote: Marsonion, thanks for the information and link. That was very helpful. You're very welcome, Rick-- but I sincerely hope it actually is helpful information, as it comes to me by word-of-mouth, and I hate having to rely on that for much of anything. Perhaps another forum member can offer some corroboration or refutation from a valid or trusted source. In the meantime, here's a few pictures of the simulated woodgrain backdoor paintjobs. Thanks for the pictures. That's going to help a lot when I repaint my door. Here is some photos with the "seem to be" the original dye from a Superior (not mine , come from Flebay!). 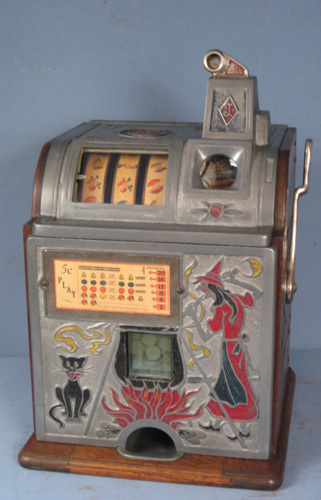 And the color is in good shape under the wood base , so , as this you have a good idea of how was the original slot machine color. And let us know the result when you finish it !! Stephane, thank you my friend.